This week has flown by so fast! I can’t believe that it’s time for another JBWW (Just Because We Wanna) Challenge. 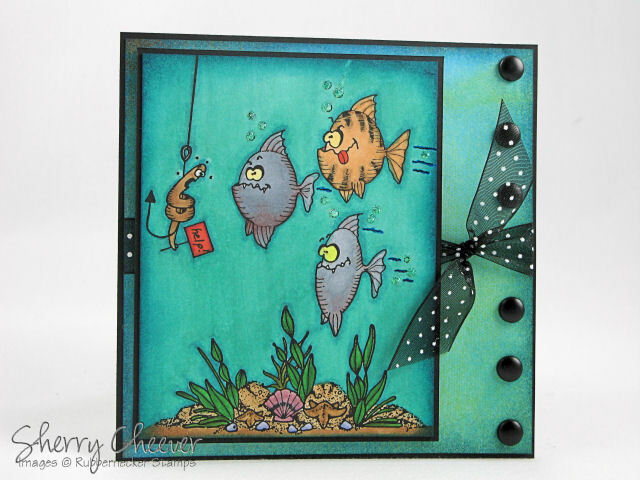 This week it’s Jeanne’s turn to pick the challenge, and she picked distressing. You can just imagine how happy I was with that one! Yep, I sure was! As with every JBWW Challenge, if you participate (which we hope you do), and post a card to your blog, please come back and link your card to either my blog or Jeanne’s, Inky Paws. If you upload to your Gallery on SCS, please use the keyword JBWW. If you’ve just stumbled across this challenge for the first time, please feel free to participate – the more the merrier!!! We love it when ya’ll play along with us. I’ve had a number of requests about distressing, and how I get those curled edges, etc. Pamm (HRSECZY on SCS) emailed me last week about this very thing. 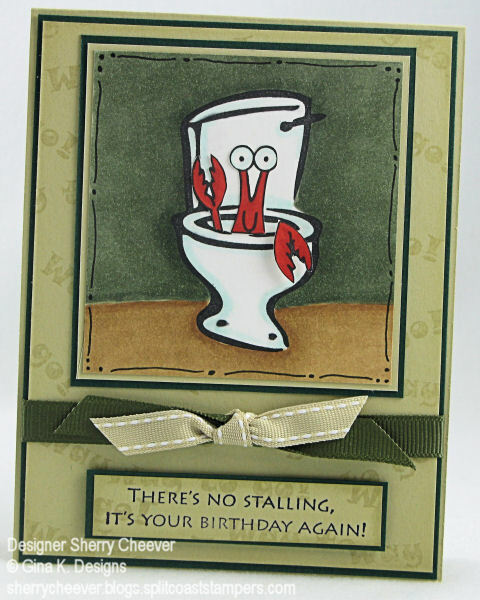 So while I was making today’s JBWW card, it occurred to me that is was an excellent opportunity to talk distressing. 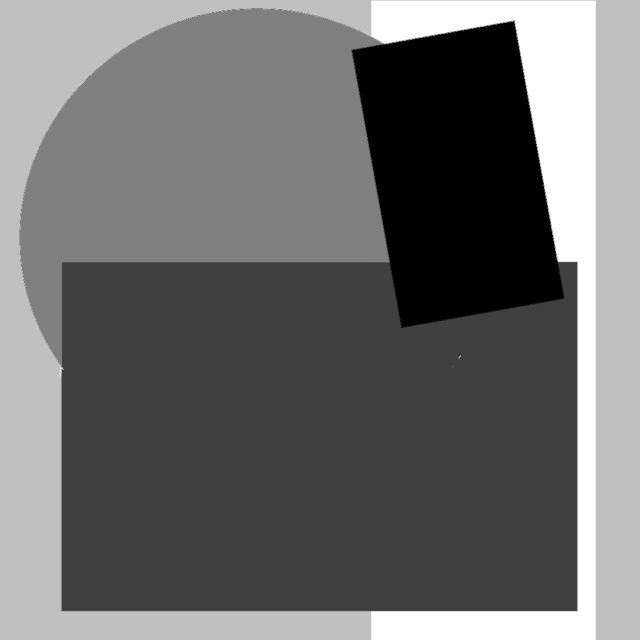 I’ve made a separate Distressing Tutorial, and it is the post immediately following this one. First, let’s talk about today’s JBWW card. 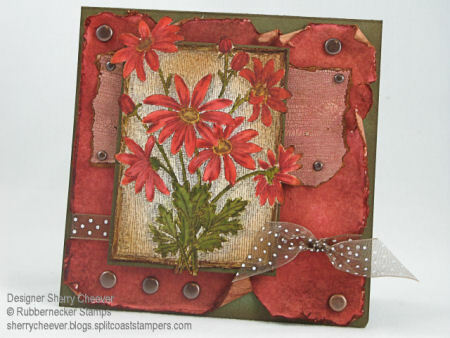 I chose to work with a daisy image from the Bold Floral Collection from Rubbernecker Stamps today. 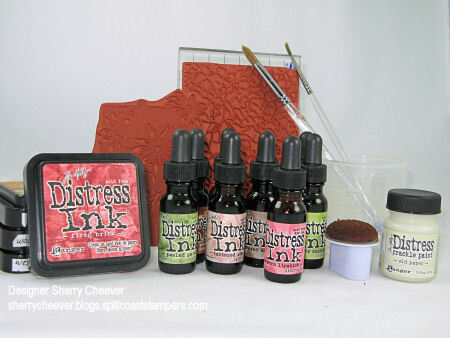 I stamped in the image on watercolor paper then water colored using Ranger Tim Holtz Distress Inks. Once the image was dry, I trimmed it out from the paper and distressed the edges of the frame only. To add more depth to the image, I decided to sponge Vintage Photo Distress Ink along all the edges, dragging it across the front of the image. By dragging the ink across the panel, it highlighted the water coloring of the daisies. The two background panels started out as white cardstock that I sponged a combination of Worn Lipstick and Fired Brick Distress Inks on. For the background immediately behind the daisies, I used Tim Holtz Crackle Paint, tore the edges of the paper off and again sponged the edges. The bottom background panel has some added Fired Brick Paint and the edges were distressed with scissors and sponged. (More detail on all the distressing follows this post in the Distressing Tutorial). 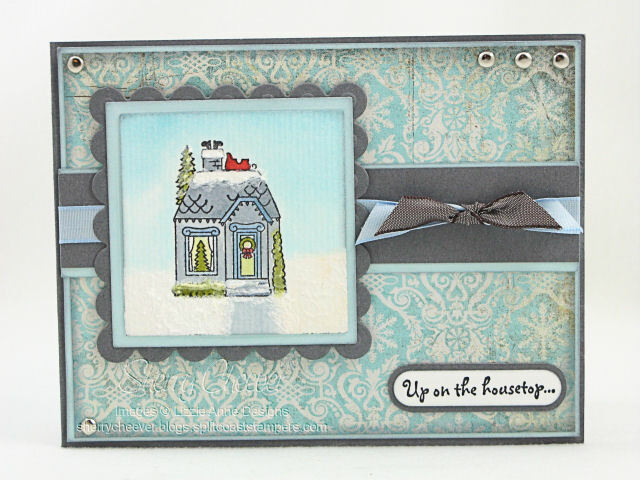 The following picture is of all the products I used to create this card, and can be found at Rubbernecker Stamp Company. I did make one mistake and included the crackle background that I decided not to use and did forget to include my ATG Gun. Sometimes ya win, sometimes ya don’t! One more thing, Rubbernecker is having their Winter Sale Event — check out all the great things on sale! JBWW Sketch Time and Some Tool Talk! Good Morning! I hope y’all have had a nice holiday weekend. Let’s get right to the JBWW Challenge today. Last week we had a request for a sketch. So, since it is my week to host the challenge, I came up with a sketch for you. 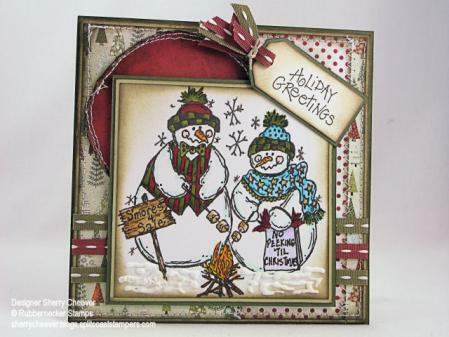 Please remember to post a link of your finished card here or on Jeanne’s blog, Inky Paws, and if you upload to your SCS Gallery, please use keyword JBWW. I’ve posted a sample below. If you are a Splitcoast Fan Club Member, you will be able to see the first card that I did with this sketch here. I thought it would be fun to try this sketch again, and to see what your interpretations would be. I decided to use a stamp from Rubbernecker today. We have anticipated the opening of Rubbernecker’s new site all weekend, and are just as anxious for the site to open as you are. The Design Team has been waiting in the wings and are so anxious to show you what they’ve been working on. The image was stamped on Georgia Pacific white cardstock and colored with Copic Markers. It’s very hard to tell the photo, but the stars on the ladies scarf, the dots on her hat and the man’s bow tie and buttons are colored with a gold Spica maker. The snowflakes have been highlighted with a Sakura Stardust pen. The edges of the image and the sentiment were sponged with Old Paper distress ink and then highlighted with Walnut Stain distress ink. The edges of the background panels, BasicGrey Figgy, were sponged with the Walnut Stain distress ink and then sewn to a panel of River Rock. The circle was cut out using a Coluzzle and the edges were distressed. To make the edges curl more, I sprayed with paper with water, and then took my scissors to scrape along the edges. Before the edges dried, I curled the distressed area with my fingers, working the paper in toward the middle. Once the circle was completely dry, the edges were sponged with Walnut Stain distress in. This panel was then sewn to the background panel. Once I had finished assembling the card, I added Tulip White Puffy Paint for the snow, and used my heat gun to make it puff up.